Examining the effects of absence on relationships, here not here (2012- )narrates life with absent partners and family. 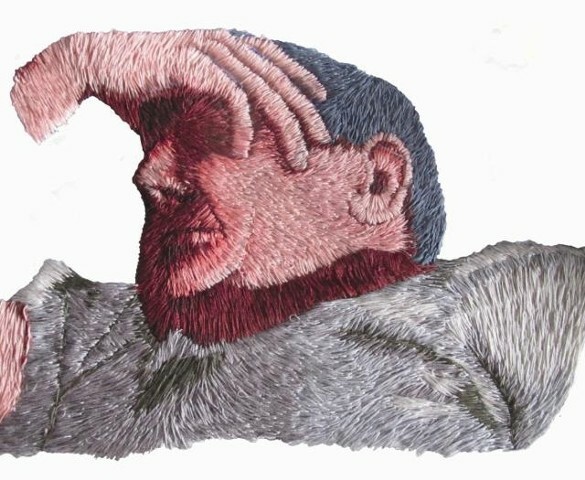 Hand embroidered portraits serve as a process of remembrance and reverence. Traditionally associated with chastity and solitude, the embroidery is done during periods of being home alone. The Embroidery Portrait: Resting (2015), is a portrait of a partner returned from traveling abroad, relaxing at home, sleeping on the couch. It portrays the emotions of being of safety and comfort at ones own home.